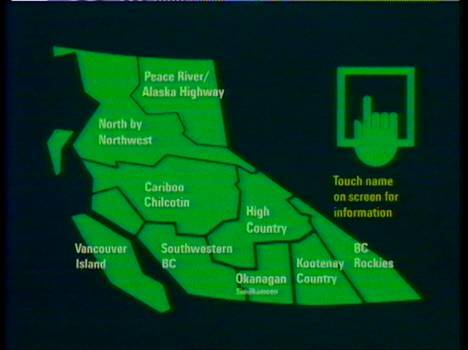 Since the late 1970s “Hollywood North” has been used to describe the film industry in Canada, specifically Vancouver. Until recently, we had very little in our holdings that reflected this important aspect of Vancouver’s past. A step toward changing that was taken with the recent acquisition of the records of Yaletown Productions Inc. 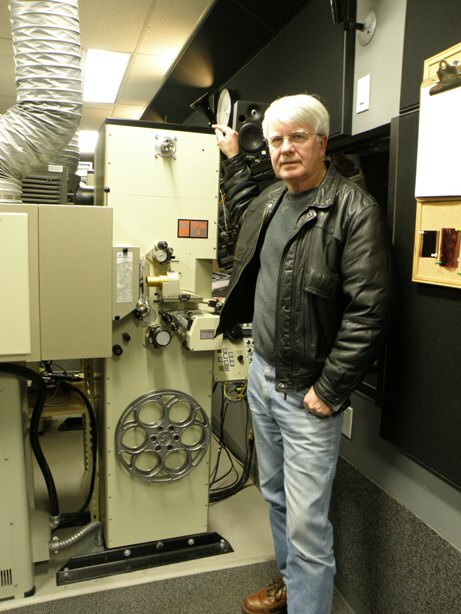 In 2010, Michael Collier donated a large volume of moving image, audio, textual and digital records to the Archives. 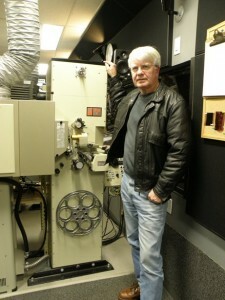 The fonds spans the more than forty years that Collier spent as a producer and director in the Vancouver film industry. Beginning with his first experimental films created while completing a degree in physics at SFU, as a member of Stan Fox’s Student Film Workshop in the late 1960s, the collection encompasses Collier’s film career up to early this century. To give you an idea of some of the moving image materials now in the Archives, we have put a few short clips on YouTube. Here you can find excerpts from our November 6th screening. Yaletown Productions Inc. won the contract to produce the internationally distributed commercials promoting Expo 86. Not only can you now find these commercials at the Archives, you can also view all of the raw footage shot to create the commercials. Here is a one-minute sample of the close to four hours of raw footage now preserved in the Archives’ holdings. Over the years Collier produced and directed documentaries, television series, a feature film, educational films, commercials for local politicians as well as companies such as Ford and Ikea, and industrial films. In total, Collier donated over 300 moving image items to the Archives, which included many items in multiple formats and at various stages in the production process. Thanks to funding from Vancouver 125, we were able to digitize all of the moving image and audio content in the donation. The Archives has kept and preserved around 300 hours of audiovisual material including raw footage and completed productions. Video materials are preserved differently from the film. Once digitized to Digital Betacam tapes as a high-quality access copy, the 16 and 35mm original films are preserved by being specially packaged and stored in the Archives’ freezer. Freezing at -18°C will allow the film to last for thousands of years. For more on preserving film, check out: Film Forever. When new access copies are required, the original can be thawed and copied again, with minimal threat to the film. 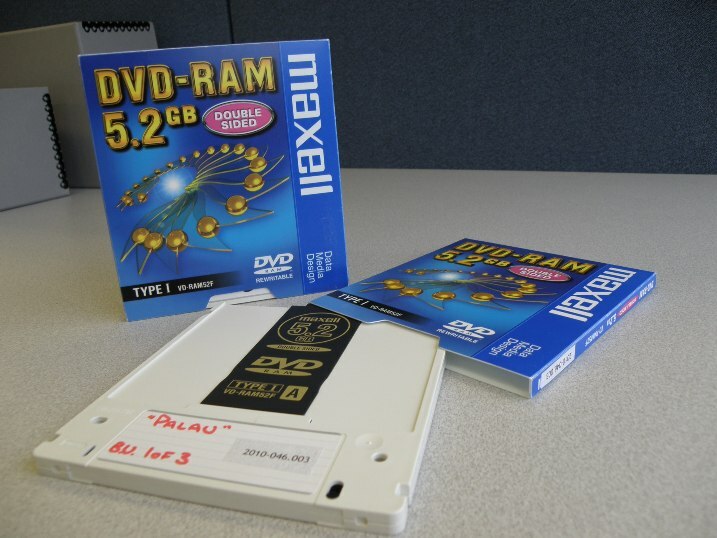 The equipment and expertise to play older videotape formats is becoming scarce, and once it is gone, we will not be able to play or copy the tapes. This is why we make preservation copies (rather than high-quality access copies) of videotape: we may only get one chance to copy it. Increasingly, the trend is towards digital preservation, and this is what the Archives has chosen to do. Access copies have been made in MP4 format and the preservation master is lossless FFV1 in a Matroska container. If you would like to learn more about preserving video materials, this 10-minute video, sponsored by the Conservation Centre for Art and Historic Artefacts, featuring Sarah Stauderman, Preservation Manager at The Smithsonian Institution Archives, gives a nice overview of some of the challenges and solutions. Stauderman mentions four kinds of television encoding systems; the Yaletown Productions fonds includes two: PAL and NTSC. She also discusses the many different formats that video can be stored in; we dealt with around a dozen formats including both open reel videos and videocassettes. 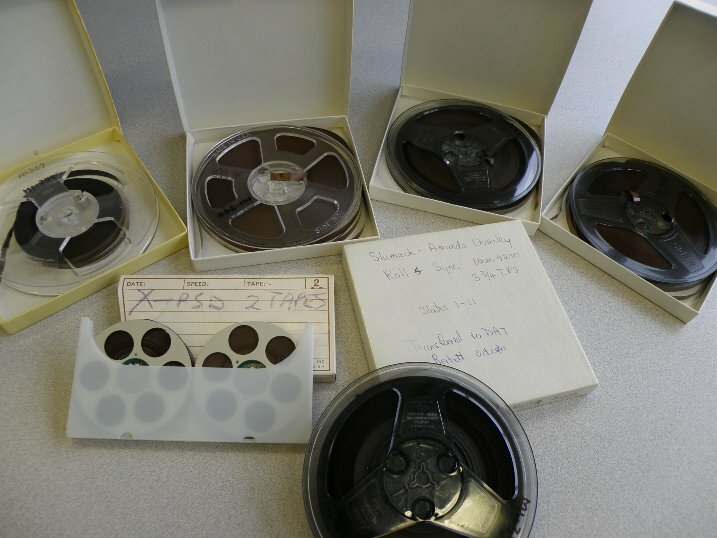 Before digitizing it was necessary to gain control over hundreds of moving image and audio items that Collier donated. Multiple forms and versions of many of the productions had to be appraised and organized. Yaletown used many leading-edge technologies: they were the first Canadian company to film for television in high definition (HD). As is the case throughout the film industry, some of the promising technologies they used did not endure. Here is the Archivist with one such technology, a 12” LaserDisc. 12” LaserDisc is a good example of a promising format that never took off. Marketplace Program [MI-535] was produced for Expo 86 and Tourism BC by Yaletown Productions Inc. It was a major exhibition in BC Pavilion for Expo 86, featuring a now lost, multi-screen laser disc interactive display. Without the original specially-programmed machine to play the 12” LaserDisc (or a great deal of money to build a specific emulator for this one item) the exact interactive features have been lost. Before playing the single copy of Marketplace Program on the LaserDisc player we borrowed, it was necessary to test the player and make sure that the player would not scratch or otherwise harm the LaserDisc. For testing purposes we bought a non-archival LaserDisc to play, The Abyss, which we found on Craigslist. Playing Marketplace Program on a regular LaserDisc player works fine except that the menu screens speed by too fast to read; it is necessary to pause in just the right spot to view the text. The digitized version, available at the Archives, also lacks the interactive nature of the original; however, it does allow the viewer to easily pause and view the features and choices that were once available through the special player and touch-screen interface. 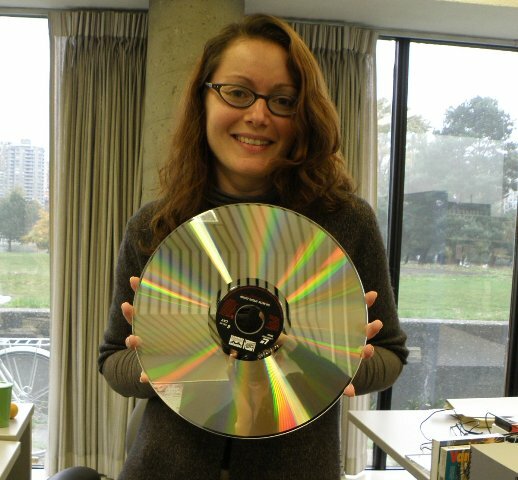 LaserDiscs were very new back in 1986 and cost over $2500 each to manufacture. Below are some examples of original in-the-field formats used for capturing audio while shooting film. MI-559 – MI-563 are audio recordings of an interview with Amanda Charnley conducted for Curse of the Lost Gold Mine. All of these have been digitized for access and preservation. A few minutes of the Amanda Charnley interview was used in the film Curse of the Lost Gold Mine (MI-491). The film footage of the interview, synced up with the 1/4’” audio reel (MI-302), can be watched at the Archives and will soon be available online. The two small 1/8” Nagra SN magnetic tapes were transferred to more accessible ¼” tape before transfer to the Archives. These originals of in-the-field audio recorded for the documentary Everest – Climb for Hope (MI-453) have been kept as examples of unique media. In addition to the completed product, the Everest – Climb for Hope series includes more than fifteen hours of raw film and video footage used to make the completed production as well as raw audio and textual materials. Have you ever saved to one of these? They were pretty high-tech in 2002. Now however, less than ten years later, it is very difficult to find a machine to read them. Luckily, these are back-up copies of material stored elsewhere in the donation. To view all our descriptions of the Yaletown fonds, visit our online search and type “Yaletown Productions” in the Keyword field. We are looking forward to providing access to the hundreds of hours of moving image material that has been digitized, but only those items without copyright restrictions will be available on the Web; the copyrighted material, along with the textual records and photographs, may be viewed in the Archives’ Reading Room. We are in the process of switching to a new access system over the next few months, so we are only providing web-based access to a sampling of the available footage right now: 27 items totalling about 8 hours of viewing. Until the new database is ready in early 2012, the remainder of the footage will only be available in our Reading Room. After the decision-making is done, the conservation and preservation measures have been taken, and the arrangement and description of the records is complete, the finding aid is published and the boxes are labelled and put on shelves. While gratifying for the archivist, usually there is no fanfare for the fonds. The records wait until a researcher finds them and uses them to write a book, or back up a thesis a hundred years from now, or support a curiosity about the past. There is a certain geeky excitement that leads archivists to want to share the records they process. I took photos of the Hollinger boxes that contained my first archival arrangement and description project back in the summer of 2009 at the North Vancouver Museumand Archives. In the case of the Yaletown Productions Inc. fonds, there will be a public screening at Vancity Theatre featuring clips from the fonds. The show, curated by Michael Collier, is an exciting look at his four-decades-long year film career. This free event sold out in a few hours. In addition to donating this substantial and valuable piece of history, Collier has given generously of his time and knowledge of the records. The Archives is honoured to provide his life’s work with a new home. And I am thrilled to be a part of making them available to the public. The Archives would like to thank the City of Vancouver’s 125th Anniversary Grants Program, and the Government of Canada through the Department of Canadian Heritage and the Library and Archives of Canada. Without this support, the Yaletown donation would have taken us many years to process and to digitize. This entry was posted in Digital Archives, Digitization, Holdings, Preservation, Public Programming and tagged digitization, Expo 86, Yaletown Productions. Bookmark the permalink. I came across this page while searching for digital preservation. I have recently retired from 21 years in Electronic Publishing and have been looking to apply my skills to the preservation of digital materials. Your example of the 12″ Laser disc for the Expo 86 BC Pavilion it home for me — I was the project manager at New Media Technologies — the company that provided the touch screen navigation for this system. I would certainly be interested in talking with you about it and its possible reconstruction. where can i find more detailed information about the FFV1/Matroska Container solution? We are using ffv1/mkv as the target preservation format for digitized videotape. We will also be using it in Archivematica when we ingest born-digital video that is not in a preservation format. We decided on this codec and container by contracting with Audio Visual Preservation Solutions http://www.avpreserve.com/ to help us find something open source that would work within our open source preservation system, and which could be manipulated with open source software. We use ffmpeg software, which is the project that developed ffv1 years ago. Ffmpeg is used extensively in Archivematica. It also comes up on the AMIA list from time to time. My name is Thomas Santalab and I co-produced a pilot documentary on travel photographers on location with Mike Collier of Yaletown Productions. The pilot had two working titles – Picture Perfect and Have Camera will Travel. The pilot followed Art Brewer, a Islands magazine photographer in Palau, Micronesia. I am trying to find a link to the show that used to be on the City of Vancouver Archives. Can you help me track down a copy as my original copies were flooded out in my previous home.